MUSIC FOR ONE is stark and simple guitar motifs that draw melodic inspiration from old acoustic blues and Erik Satie. They mingle with a modern experimental aesthetic that is created live in front of the audience with a guitar, effects, and bits from the hardware store. As chaotic as the times we live in, it can change at any given moment, effects boxes twisting the emotive tones into a cavernous roar of feedback and throbbing clicks. Light and dark, loud and quiet, it’s somewhat comforting to know that a guitar can still confuse and enchant an audience. 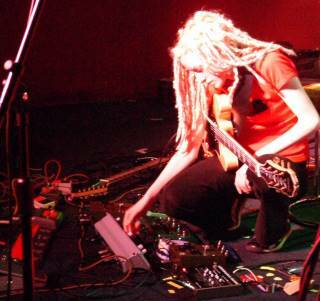 MUSIC FOR ONE is Sherry, a Canadian now living in London, and she has played on bills alongside artists such as Do Make Say Think, Sunn0))) and Christina Carter. She has a 7" record on Seren Records and 3 self-released CDs, with the newest album "OKeh" reviewed in the April 2006 issue of the Wire magazine.